I rather liked the idea in this video.... playing it backwards gives a weird feel to the movement of the material. It would be interesting to explore the idea of filming a dancer, and playing it backwards as the dancer performs in front of the video. So, yes, labels are important!! without the "Label" or instructions, we didn't know what we were supposed to be doing. Not that I'd have bothered if I'd known it was meant to be therapy, not art! Títol The participatory museum / by Nina Simon. Publicació Santa Cruz, Calif. : Museum, c2010. Descripció v, 352,  p. : il. ; 23 cm. 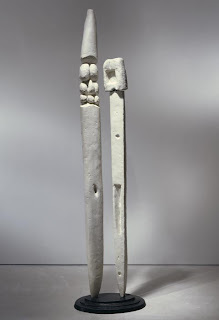 An occasional series of sculptures looking at ideas, forms and symbols. And a good thing to do while waiting for paint to dry. Or to use up spare paint. 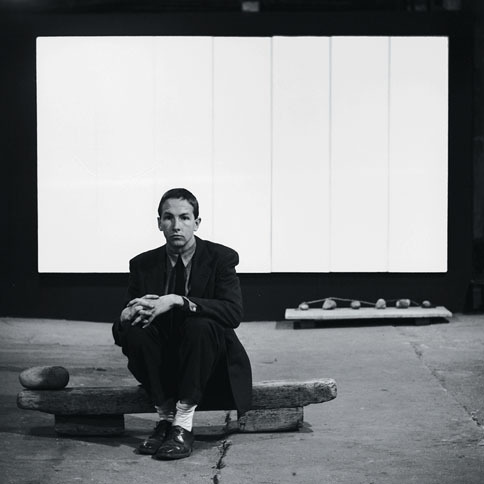 "Photograph of Robert Rauschenberg seated on Untitled (Elemental Sculpture) with White Painting (seven panel) behind him at the basement of Stable Gallery, New York (1953). p.254 "Aesthetic surprise comes from inspiration and sensibility as well as being abreast of the artistic times." p.255 "The best of Monet´s lily pad paintings... are not made any less challenging and arduous ...by their nominally sweet colour. Equations like these cannot be thought out in advance, they can only be felt and discovered." p.256 "That presence as achieved through size was aesthetically extraneous, I already knew. That presence as achieved through the look of non-art was likewise aesthetically extraneous, I did not yet know. 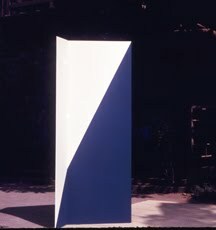 Truitt´s sculpture had this kind of presence but did not hide behind it." Thoughts on a graffiti sculpture project. 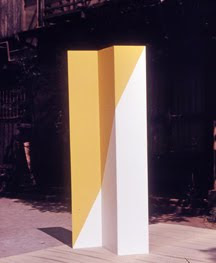 My plan is to put four or five small scale concrete or plaster sculptures on "plinths" a number of locations in Barcelona. They will have to be small enough and light enough to carry on my motorbike from the studio. Each one will have a label with a QR code giving information about the work, the location of the next work and asking for photos of the work to be uploaded. 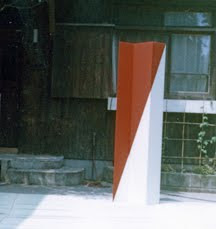 I will document the sculptures on site through video and photos, and possibly interact with the audience. To make some more work public, for free. To clear some space in my studio. 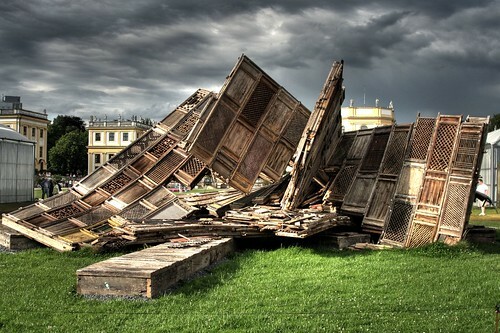 To create and document some public art. To talk to people about my art. To try out QR code technology. To make myself feel like an artist. To finally get done an idea I had several months ago. So why have I been avoiding this? Well, partly because it´s a bit scary. But also because I´m not completely comfortable with my concrete sculptures. And I´d like to involve some other people. But now I have a new plan... to work with GAP (Gracia Arts Project) and spend a day together making some AH sculptures, and then the next day to take them out into the streets of the Gotico and leave them around. Depending on the number of people I can get involved, I hope to make 5 or 6 sculptures for this project. And we´ll see how long they last. Hopefully we´ll have a couple of people for each sculpture, or a rotating shift system, so I can have a record of the public looking at them, photographing them etc.